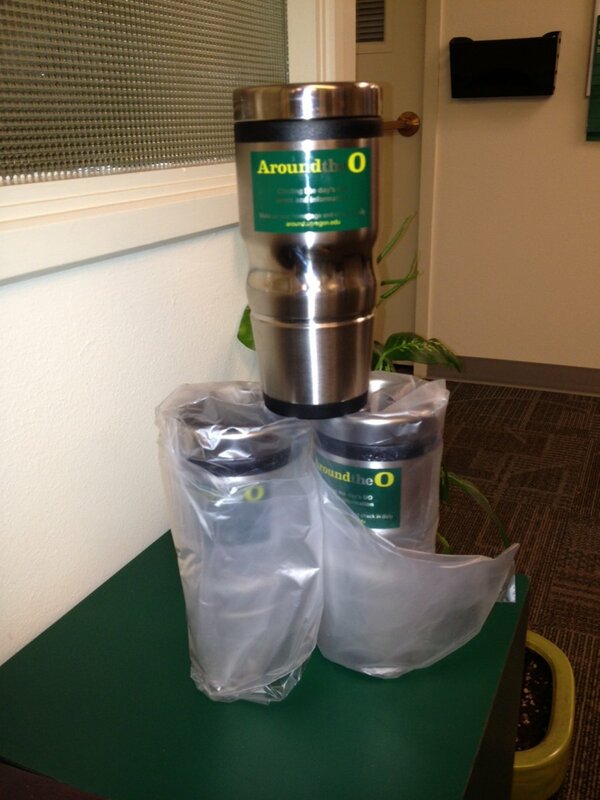 Ten more UO employees won stainless steel AroundtheO travel mugs when their numbers were drawn in today's AroundtheO scavenger hunt contest. Each submitted one or more correct answers in this week's daily contests to become eligible for the weekly drawing. This week's winners are: Amy Green, College of Education; TK Landazuri, Philosophy Department; LynElle Jester, Business Affairs; Kathleen Birkholz, Registrar's Office; Karen Jefferis, Provost's Office; Jessica Matthiesen, PPPM; Hans Engel, Chemistry Department; Lauren Pinchin, Oregon Bach Festival; Kran Varani, Chemistry Department; and Esther Harclerode, UO Development. Next week's scavenger hunt drawing will be for an iPad – the fifth major prize to be given away in the contest, which began in November. Laura Lacasa of the Financial Aid and Scholarships Office, Charlotte Wise of the UO's Neuroinformatics Center and Joyce Nims of the College of Education have each won Duck Store $100 gift cards to The Duck Store; and Amy Lake, who works in the UO Libraries warehouse, won the contest's first iPad. The contest will continue through January. Working from a list of 210 correct responses received in this week's five daily contests, an online random number generator picked 10 numbers between zero and 210. That determined the weekly prize winners: 48 (Green), 117 (Landazuri), 103 (Jester), 82 (Birkholz), 89 (Jefferis), 121 (Matthiesen), 40 (Engel), 50 (Pinchin), 11 (Varani) and 26 (Harclerode). Find the correct answer to the question of the day and e-mail it (subject line: SCAVENGER HUNT ANSWER) before noon to around@uoregon.edu.